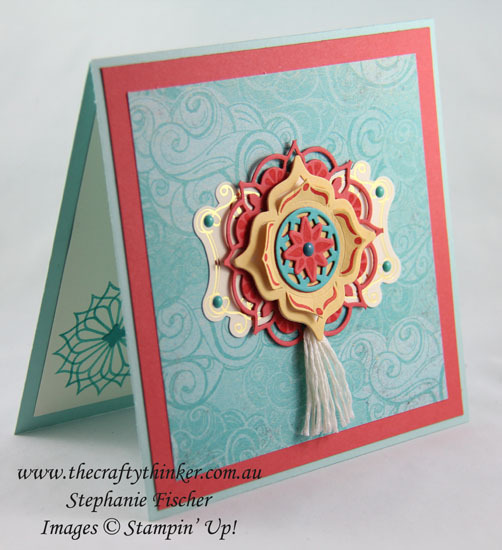 This card is entered into this week's Crazy Crafters Project Highlights. Click here to see all the beautiful cards and vote for your favourites. I was getting to know the Eastern Beauty Bundle today and loving its versatility. My goal for the day, however, was to use some retiring products - so I did both! The colours I used were inspired by those included in the Cupcakes & Carousels Designer Series paper pack: Bermuda Bay, Calypso Coral, So Saffron and Very Vanilla with a card base of Pool party. 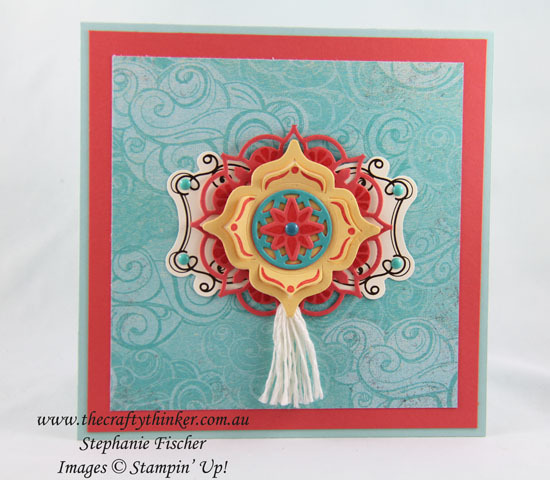 The use of Stampin' Dimensionals provides space for the tassel as well as adding some depth to the card. I've really only just dipped my big toe into the creative pool that is the Eastern Beauty Bundle and already I'm blown away by it's versatility and ... well ... beauty!